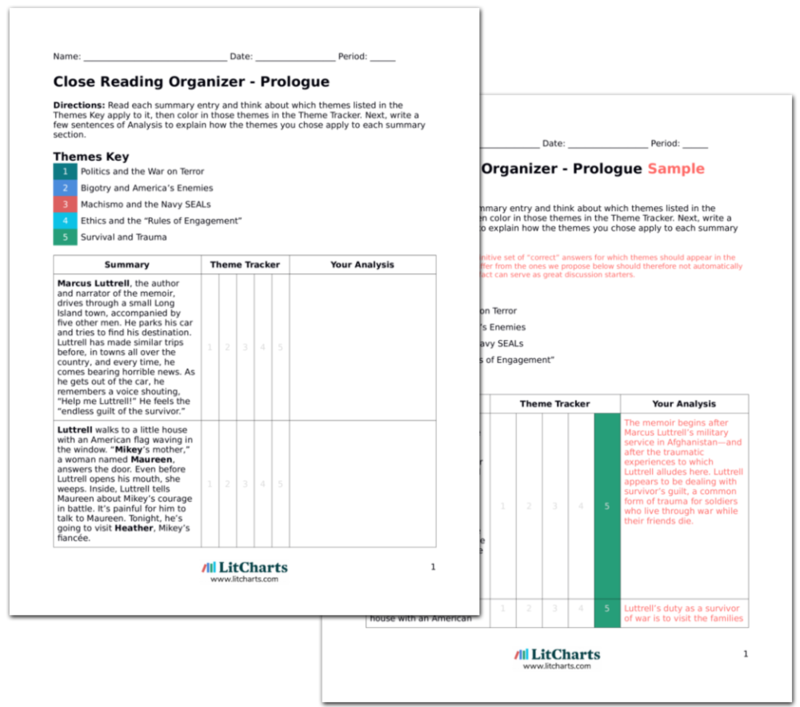 LitCharts assigns a color and icon to each theme in Lone Survivor, which you can use to track the themes throughout the work. By the time Luttrell summons the strength to move, it’s pitch-black on the mountain. He climbs up the mountain, reasoning that it’s better to be high up in the event of another shoot-out. He also thinks that it’ll be easier to get help from the top of the mountain—a helicopter would have an easier time landing there. Even though he’s in a lot of pain, Luttrell keeps an impressively clear head, forming a plan to return to an American military base as soon as possible. Luttrell slips and falls about ten feet. Even though he’s in enormous pain, he gets up and keeps climbing. Suddenly, he hears the cracks of twigs. This means one thing: he’s being followed, probably by Taliban soldiers, who may have night vision goggles. As the night goes on, Luttrell hears American aircraft flying overhead, and tries to transmit a distress signal. Nobody responds to the signal, however. Luttrell deduces from the crack of twigs that there are Taliban soldiers looking for him in the mountains—soldiers who are much more familiar with the terrain and much better equipped for night operations. It’s almost unbelievable that Luttrell is able to avoid the Taliban that night. By 2 am, Luttrell is still climbing up the mountain. He can hear Taliban soldiers not far away. He falls again, this time dropping his compass and strobe light (for distress signaling). He’s forced to navigate by looking at the North Star. In this moment, he thinks back to Hell Week. He tells himself that, just as he got through Hell Week by “sucking it up,” he’ll get through this night. This is a great example of why Hell Week is so important for SEALs. It’s painful and psychologically challenging, but it’s also the only effective way to prepare soldiers for the real stresses of warfare. Thus, when Luttrell finds himself in a real emergency situation, he’s able to stay relatively calm and summon the will to push on. At 6 am, Luttrell is still climbing up the mountain. He’s desperate to find water, and he’s so dehydrated that he’s beginning to hallucinate. At times, he’s in so much pain he crawls on his belly. He remembers the Bible’s 23rd Psalm: “Yea, though I walk through the valley of the shadow of death, I will fear no evil.” Suddenly, Luttrell sees a small brook and waterfall ahead of him. Stunned, he approaches the brook. In the previous passage, Luttrell found inspiration in his SEAL training; here, he finds inspiration in Christianity. The 23rd Psalm has inspired countless people with its message of hope and the transcendence of earthly pains. Luttrell then presents the appearance of the waterfall as a kind of miraculous answer to his prayers. By this time, the American military has concluded that Luttrell is dead. The story of the SEAL team’s defeat makes national news, and Holly Luttrell is devastated when she hears that her child has been killed. By the end of the day, dozens of people have showed up at the family’s house to offer their condolences to Luttrell’s parents, his twin brother Morgan, and his “kid” brother Scottie. Among them is Billy Shelton, who nobody has ever seen in tears before. For a book about tough, strong soldiers, there are a surprising number of scenes in Lone Survivor featuring grown men weeping. But this is because of the gravity of the situation that now threatens Luttrell’s life—it’s seen as appropriate for “real men” to cry when the circumstances are right. Billy Shelton is a “manly man,” but he’s justified and humanized in weeping for the death of Marcus Luttrell, his pupil. Back on the mountain, Luttrell approaches the waterfall, when suddenly a Taliban soldier fires at him, hitting him in the thigh. Summoning all his strength, Luttrell runs away from the brook, knowing that it’s harder to hit a moving target than most people would think. He runs, crawls, and rolls down the mountain for the next forty-five minutes. Even though Luttrell is already wounded and losing a lot of blood, he’s able to run away from the Taliban soldier—he explains that this is because it’s pretty hard to hit a moving target, even for an experienced soldier. However, some have suggested that Luttrell is again exaggerating the danger he faces. Luttrell tries to hide in a forest on the mountain, but a Taliban scout approaches him. Strangely, the scout is unarmed. (The Taliban often delegate responsibilities in this way, Luttrell says, with one person carrying the water, one person scouting the terrain, etc.) Luttrell shoots the scout and then lobs a grenade in the direction of the rest of the search party. It explodes, and there’s quiet for a moment. Luttrell continues to defend himself from the Taliban successfully, thanks to a mixture of resourcefulness and sheer luck (had he run into someone other than the water carrier, he probably wouldn’t have been so lucky). Breathing heavily from his running, Luttrell tries to decide what to do. He moves west, perhaps three or four miles, toward the waterfall. No Taliban soldiers seem to be present. Just before he drinks some water, he looks down at Sabray, a Pashtun village in the distance. While looking out at the village, his left leg gives way, and he falls down the side of the mountain once again. In great pain, he forces himself to crawl back toward the water. Amazingly, he still has his rifle. Luttrell continues to push himself to survive, even after he falls down the side of a mountain once again. As he freely admits, he survives because of his willpower but also his luck. Luttrell is understandably frightened—the only people with whom he’s interacted in the last few hours have been trying to kill him. But he’s also smart enough to realize that these men obviously don’t want him dead, since they could have shot him while he was drinking from the waterfall. Luttrell sees three other Afghan men approaching, him, also carrying guns. Nobody fires. One of the men cries, “American! Okay!” Luttrell asks, “Taliban?” And the man cries, “No Taliban!” Luttrell realizes that these men mean him no harm. The leader of the men approaches Luttrell, smiling, and says, “Sarawa,” his name. He adds, in rough English, that he’s the village doctor. Realizing he has no choice but to trust this man, Luttrell says, “Hospital. Water.” Sarawa motions for a man to bring Luttrell water. Grateful, Luttrell shows Sarawa that he’s wounded and bleeding badly. Luttrell has never met these Pashtun men before, and based on his comments in previous chapters, he finds the Pashtuns to be a wild, dangerous group of people. But he accepts their help, since his only real alternative is to remain in the mountains and slowly bleed to death or be discovered and killed by the Taliban. Luttrell doesn’t realize it at the time, but Sarawa and his men take a huge risk by helping Luttrell. Sarawa and his men are Pashtuns, an ethnic group that mostly supports the Taliban. However, Sarawa is a strong believer in the ancient Pashtun principle of lokhay warkawal, the law of hospitality. For Sarawa, to help a wounded man represents an unbreakable bond: he must defend the man to the death, from hereon out. As Luttrell explains it, Sarawa agrees to help him because of an arcane Pashtun custom. This is certainly true in part, but it’s not the whole story. At least in part, Sarawa agrees to help Luttrell because of basic human decency—he makes a choice, rather than simply honoring an obligation. By characterizing Sarawa in this way, Luttrell makes him seem more alien, from an American perspective, and less in touch with universal moral values. Luttrell, of course, has no idea what Sarawa is thinking. From Luttrell’s perspective, Sarawa and his friends may have had family who were killed by American soldiers. And yet, Sarawa orders two men to carry Luttrell. As they do so, Luttrell takes his last grenade and pulls the pin, holding it tight. If the Pashtuns try to hurt him, Luttrell will release his grip and detonate the grenade, taking enemies with him. Luttrell continues to distrust the Pashtuns, even while they save his life. While one could attribute this to prejudice or xenophobia, it could also be argued that Luttrell is just disoriented and, quite understandably, frightened, given what’s happened to him in the last day. Arn, Jackson. 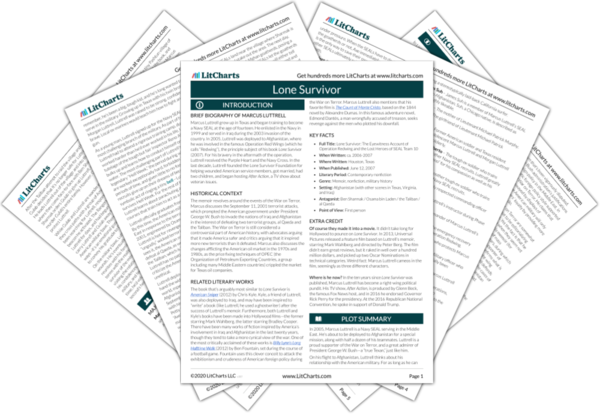 "Lone Survivor Chapter 9." LitCharts. LitCharts LLC, 25 Jul 2017. Web. 20 Apr 2019. Arn, Jackson. "Lone Survivor Chapter 9." LitCharts LLC, July 25, 2017. 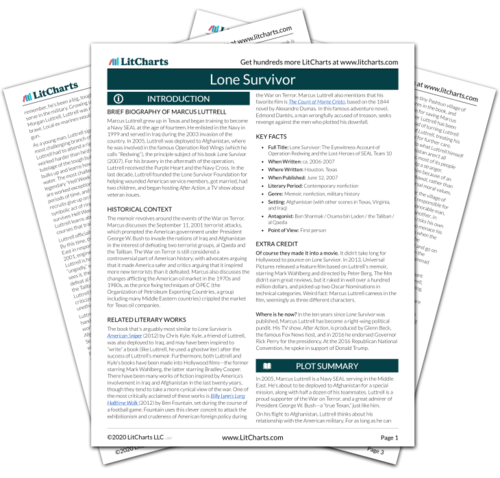 Retrieved April 20, 2019. https://www.litcharts.com/lit/lone-survivor/chapter-9.